George Orwell’s 1984 is not, to my mind, a good novel. Its plot is too baggy for my liking, its characters scantily sketched, and as a prophecy of a dystopian future, Huxley’s Brave New World proves more accurate by an order of magnitude. 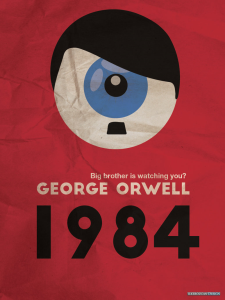 What 1984 has going for it, however, is that it is, unlike so much of the rest of Orwell’s fiction a ‘true’ novel. Let me tell you what I mean. With the exception of his first published novel, Burmese Days, Orwell’s earlier books were largely what you might call ‘romantic’. I use this term advisedly, for Orwell was not a romantic like Wordsworth or Coleridge or Shelley or Keats. True, his well-known essay on his schooldays, Such, Such Were the Joys does contain one or two wisps of Wordsworthian observations on the corrupting influences of education upon a child (though the phrase that the essay most brought to my mind is Shakespeare’s – “the whining schoolboy, with his satchel / And shining morning face, creeping like snail / Unwillingly to school”) but he practised no Neo-Platonism and, whilst he obviously valued nature, he found in it none of the special significance of writers like Shelley. No, when I brand the early Orwell romantic, what I am groping towards is this sense – I suppose a better word for it would be humanism – that human goodness, the best of human virtues (in particular love) possess some kind of transcendent value; even in the depths of the most terrible, terrible poverty and suffering, things like ‘true love’ can exist. Keep the Apidistra Flying is a case in point. Its protagonist, Gordon Comstock, is a pretty unlikeable man, who spends much of the novel treating his sort-of-girlfriend-sort-of-not Rosemary absolutely horribly, but through her long-suffering love for him is redeemed into the bliss of a comfortable middle-class marriage. Orwell asserts – if a bit more circumlocutorily – this same humanism in Lear, Tolstoy and the Fool. Tolstoy is sanctioned for wishing “we would stop breeding, fighting, struggling and enjoying, if we could get rid not only of our sins but of everything else that binds us to the surface of the earth–including love”. Orwell doesn’t go into the matter in detail in this essay, but even from this short quotation we can see the special place ideas like love had in his thoughts, how much he clearly believed in them. 1984, however, presents a very different world to that painted in Orwell’s early novels and much of his essays. It has its quotient suffering and its grinding, Dickensian poverty (both of living standards and spiritual ones) that is a mainstay of so much of his other works, but it lacks the same romantic, even childish, belief in the transcendent power of love. At the centre of the book is the relationship that develops between Winston and Julia, as deep and committed a relationship as any in Orwell’s fiction, in a word, love. And yet love does not prove strong enough to endure in the face of the threat of a nightmarish rat-filled head-cage. Winston betrays Julia and Julia betrays him. The novel ends with love only existing in one thing: Big Brother. 1984, then, sees, for the first real time in George Orwell's fiction and non-fiction, it seems to me, definite limits allowed on the power of human virtue, of human good, of love. Though it makes for uncomfortable reading, it strikes me that this realism (for who among us is now still naïve enough to believe in such things as ‘true love’?) is the thing of most value in Orwell’s last novel. The kind of sloughy sentimentalism, the kind which rears its ugly head in poems like A Happy Vicar I Might Have Been, finally dies its good and natural death in 1984. And the result is a novel that, though disturbing, is the most tragic and most true Orwell ever wrote. George Orwell&rsquo;s 1984 is not, to my mind, a good novel. Its plot is too baggy for my liking, its characters scantily sketched, and as a prophecy of a dystopian future, Huxley&rsquo;s Brave New World proves more accurate by an order of magnitude.